One our favorite places to visit is the Hominid Hunting section at the Smithsonian Blog. At Bigfoot Lunch Club we believe hominids and anthropology go hand-in-hand with Bigfoot research. Sometimes the point where these sciences cross paths is so stark that an institution entertains questions we (Bigfoot enthusiast) ask ourselves. A reminder: In 1988, due to a high volume of inquiries on the subject of Bigfoot, The Smithsonian developed a formal Bigfoot response letter. 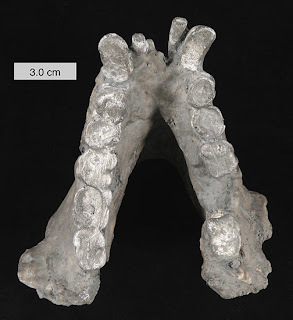 Scientists first learned ofGigantopithecus in 1935, when Ralph von Koenigswald, a German paleoanthropologist, walked into a pharmacy in Hong Kong and found an unusually large primate molar for sale. Since then, researchers have collected hundreds ofGigantopithecus teeth and several jaws in China, Vietnam and India. Based on these fossils, it appearsGigantopithecus was closely related to modern orangutans andSivapithecus, an ape that lived in Asia about 12 to 8 million years ago. With only dentition to go on, it’s hard to piece together what this animal was like. But based on comparisons with gorillas and other modern apes, researchers estimate Gigantopithecus stood more than 10 feet tall and weighed 1,200 pounds (at most, gorillas only weigh 400 pounds). Given their size, they probably lived on the ground, walking on their fists like modern orangutans. The features of the dentition—large, flat molars, thick dental enamel, a deep, massive jaw—indicateGigantopithecus probably ate tough, fibrous plants (similar to Paranthropus). More evidence came in 1990, when Russell Ciochon, a biological anthropologist at the University of Iowa, and colleagues (PDF) placed samples of the ape’s teeth under a scanning electron microscope to look for opal phytoliths, microscopic silica structures that form in plant cells. Based on the types of phyoliths the researchers found stuck to the teeth, they concluded Gigantopithecus had a mixed diet of fruits and seeds from the fig family Moraceae and some kind of grasses, probably bamboo. The combination of tough and sugary foods helps explain why so many of the giant ape’s teeth were riddled with cavities. And numerous pits on Gigantopithecus‘s teeth—a sign of incomplete dental development caused by malnuntrition or food shortages—corroborate the bamboo diet. Ciochon’s team noted bamboo species today periodically experience mass die-offs, which affect the health of pandas. The same thing could have happened to Gigantopithecus. Further evidence of Gigantopithecus‘ food preferences and habitat was published last November.Zhao LingXia of the Chinese Academy of Sciences and colleagues analyzed carbon isotopes in a sample of Gigantopithecus teeth. Plants have different forms of carbon based on their type of photosynthesis; this carbon footprint is then recorded in the teeth of animals that eat plants. The team determined Gigantopithecus—and the animals living alongside it, such as deer, horses and bears—ate only C3 plants, evidence the ape lived in a forested environment. This work also supports the proposed bamboo diet, as bamboo is a C3 plant. Glad to see the Smithsonian maintaining its tradition of objective consideration of the question of Sasquatch/Bigfoot. Gigantopithecus has often been pointed to as a potential antecedent of sasqutch — after all it is a species that is the right size in the right place at the right time. 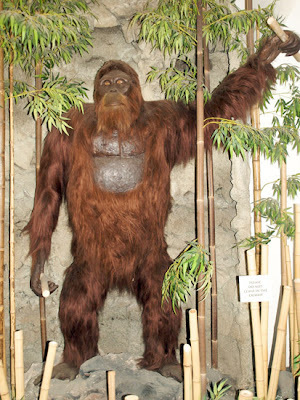 George York’s reconstruction of Gigantopithecus (pictured above) conveys the sense of the enormity of the ape, but it seems unlikely that a terrestrial ape would retain the limb proportions and suspensory specializations of an over-sized orangutan, if it ever even possessed them to begin with. Fragmentation of the Pleistocene forests might just as well have spawned novel adaptations as driven Gigantopithecus to extinction. The extremely sparse fossil record for this large and likely rare ape provides only a meager glimpse of its past range and distribution. As for diet, the recent paper pointing to a C3 diet and therefore a forest habitat is an important addition to our understanding. It really doesn’t lend that much support to the “bamboo hypothesis.” Omitted from discussion is reference to the analysis of dental microwear, which says something about the composition of such a C3 diet (Bamboo feeding, dental microwear, and diet of the Pleistocene ape Gigantopithecus blacki. Daegling, DJ | Grine, FE. South African Journal of Science. Vol. 90, no. 10, pp. 527-532. 1994). This pointed to a catholic diet most similar to that of chimpanzees, not the what was predicted for a specialized bamboo feeder. The characterization of a lumbering 1,200 quadruped (or biped for that matter) –”the size of a polar bear” — is misleading. I suspect few would want to challenge a polar bear to a foot race.